Errol's best friend and teddy, Thomas, is sad because he wishes he were a girl, not a boy teddy, but what only matters to both of them is that they are friends. 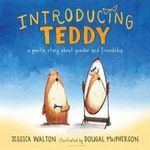 Walton, Jessica, "Introducing Teddy" (2016). DIVerse Families. 146.